ATDB • View topic - What's this rail at an angle before the catchpoint? What's this rail at an angle before the catchpoint? What's the rail at an angle circled in red before the catchpoint meant for? Re: What's this rail at an angle before the catchpoint? I think it is to guide the right wheel of the train away from the converging track, when a train is coming from the top of the photo. In some cases, I think there will be one for the right wheel as well. 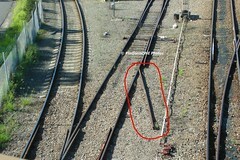 Newcastle Flyer wrote: What's the rail at an angle circled in red before the catchpoint meant for? It's to ensure the derailed train moves AWAY from the point of conflict the catch point is protecting, They are not always provided and if they are, are not usually this long. Presumably, the track engineers do a calculation based on the probable range of speeds a train is likely to be doing when trapped by the catch points and that decides what they provide. sunnyyan wrote: I think it is to guide the right wheel of the train away from the converging track, when a train is coming from the top of the photo.